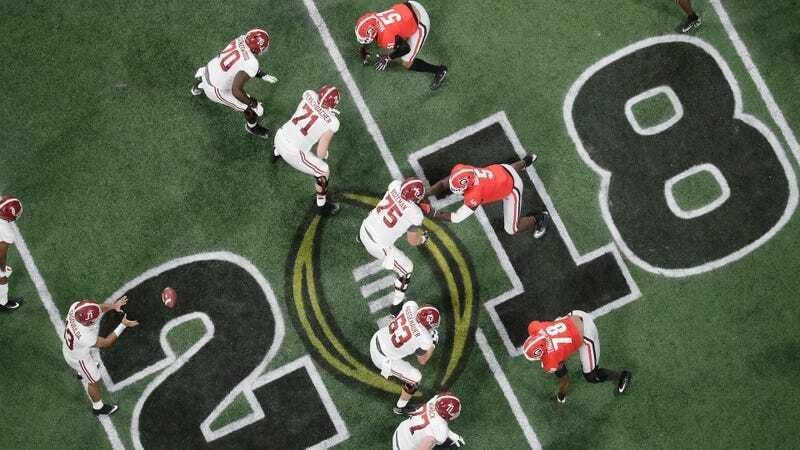 Alabama overcame being shut out at the half to beat Georgia in overtime, 26-23, to win this year’s College Football Championship national championship. After garnering just four first downs in a sleepy first half and falling behind 13-0 at the half, Alabama’s third-quarter decision to bench Jalen Hurts for freshman Tua Tagovailoa—whose only snaps so far this season had come when Alabama was leading by double digits—got the offense going. Alabama was in control for the fourth quarter, outscoring Georgia 10-0. But their final drive wasn’t enough to seal things up, when kicker Andy Pappanastos missed his second field goal of the night, a 36-yarder, and sent the game to overtime. Georgia took the ball first in OT, but quarterback Jake Fromm seemingly squandered their chances of putting anything on the board when he was sacked for a loss of 13 yards on third down—only to be saved by kicker Rodrigo Blankenship, who nailed a 51-yard field goal to put the Bulldogs up, 23-20. Alabama answered with Tagovailoa getting sacked, just as fellow freshman QB Fromm had.